Staples at Lollapalooza in August. Photo by Kate Gardiner. If you’re hankering for more Mavis before her new album comes out, check out this excellent conversation she had in 2008 with young people from the Chicago Freedom School. Staples describes how in her youth there was an uneasy relationship between gospel and R & B; gospel artists who “crossed over” to singing the blues for a more secular, mainstream audience often felt the wrath of their churchgoing brethren. (A subject explored in depth in another great Amplified event, Sinners in the Choir: The Black Church and the Devil’s Music.) Here, Staples describes her introduction to secular music during the summers she spent with family in Greenwood, Mississippi. It seduced her, but she never abandoned her gospel roots. 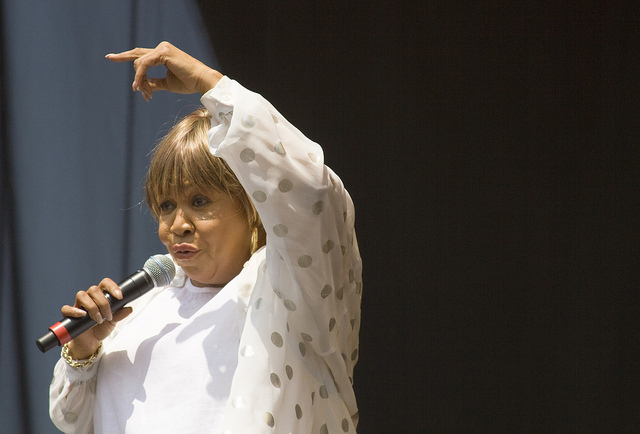 Click here for Mavis Staples’ full talk with the Chicago Freedom School. The event was held at the Jane Addams Hull-House Museum and was recorded by Chicago Amplified, a program of Chicago Public Media. Editor’s Note: The version of “Since I Fell For You” that Mavis Staples likely heard as a child in Mississippi was the 1947 version released by Annie Laurie with Paul Gayten and His Trio, which according to Wikipedia eventually reached #3 on the “Race Records” charts and #20 on the pop charts. I used the Nina Simone version from 1967 because I liked how it matched the cadence of Staples’ rendition during her talk. You can find the Annie Laurie version on iTunes, although I don’t think I can post it here in its entirety because of copyright issues.